Before coins started to circulate in ancient Egypt after its conquest by Alexander the Great in 334 BC, there was perhaps the first monetary system in the world where a form of paper money emerged. There was a unit of account based on weights of gold, silver and copper whereby they were measured in units of weight known as deben (around 90 grams) that was used to settle bills and to trade. Records from the Eighteenth Dynasty (1550-1295 BC) show that often the actual metal, however, did not in fact change hands. Instead, metal formed only a unit of account rather than a medium of exchange by which everything was valued for exchange. Egypt had no easily accessible source of silver, yet curiously the Egyptian word for silver, hedj, came to mean something close to “money”. Gold existed in northern Africa and Turkey had a natural allow of gold and silver known as electrum. It was the Greeks who had silver but little gold and in Italy they had copper. The Bible tells us that gold and silver were weighed. Clearly, metal was being exchanged as we discussed with the Roman lumps of bronze – in lumps that required weighing for each transaction. These ingots and metal rings date from the fourteenth century BC and were found at el-Amarna. 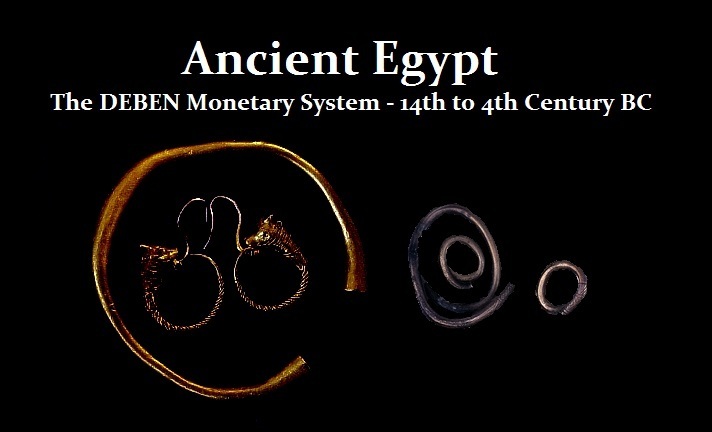 They give us rare archaeological evidence for Egypt’s earliest money system. The complete ingots weigh around 3 deben (265-286 grams) and the rings seem to be fractions of the deben. It is hard to say where gold first began to be prized. It is likely to have been in Egypt, for it was regarded as the tears of the sun, which of course was a god. What is clear, gold first emerged purely as a royal jewelry object and not something for the common man. It is found in early royal tombs in very ancient times. In order for gold to acquire a value, there had to be enough of it to go around. Thus, only as gold mining expanded do we find it becoming a valuable commodity beyond the wealth or pleasure of the sovereign. Mining did exist in the Stone Age, but it was very limited to practical ventures digging for primarily flint to be used for arrow heads and axes. Copper mining is known to date back to 4500BC in Serbia. While the Egyptians were mining turquoise in the Sinai for luxury around 2600BC, it was the wealth of the famed King Solomon that came from mining. It was not gold, but copper mines in the 9th Century BC that made him a very wealthy man. It was the Greek historian Siculus Diodorus (1st Century BC) of Agyrium, Sicily, who wrote a 40 volume work of universal history known as the Biblioteca Historica, which is invaluable since no other continuous historical reference has survived. This informs us that Egyptian gold mines in Nubia were maned by those declared to be criminals or dissidents who were sentenced to work there where they died. The gold mines of Nubia were tremendous for they not merely supplied an incredible amount of gold for the Egyptians, but they were still a great source of wealth thousands of years later. This vast gold reserve of Nubia accounted for much of the gold known at the time prior to its discovery in Turkey. Pharaoh Thutmose III around 1450BC is said to have made an offering at the Temple of Amen in Thebes of some 13.5 tons of gold – a staggering amount of about 441,265 ounces. You may have seen the exhibit of Tutankhamen with his solid gold death mask and a solid gold casket. This amount of pure gold is simply breathtaking. Nubia was an ancient region in the northeastern Africa extending from the Nile River to the Red Sea and southward to about Khartoum, which is now Sudan, and westward to the Libyan Desert. The southern portion was known as Kush (Cush) to the Egyptians, but it was called Ethiopia by the ancient Greeks. It was actually this lower region that saw historically the earliest known phases of state formation on an A-Group type of culture with a kingship. It appears that with the rise of Egypt, this early culture of an A-Group culture was extinguished with the rise of Egyptian dynasties. It was Pharaoh Snefru (c 2575 BC) who conducted raids into Nubia engaging in mineral exploitation. It was Sesostris I of the 12th Egyptian dynasty who invaded Nubia about 1915 BC and named the region “Cush” giving this people the name known in history as the Cushites. Gold was the color of the sun and became the object of royal desire. The sheer quantity of gold coming out of Nubia was truly massive in proportion to the population. Gold was neither a necessity nor even a practical object. It was purely a religious object, the “tears of the sun” that became highly prized. In Turkey, Anatolia, gold was discovered in the river at Sardis. Its natural state was then known as “electrum” meaning it was a mixture of gold and silver. Gold was not ready for prime time. It was viewed as an object of religion to be possessed only by kings, and it was not yet available in sufficient quantities to enable it to emerge as a viable MEDIUM OF EXCHANGE. It took nearly 1,000 years for gold to surface in sufficient quantities to provide a universal exchange medium or even to become a UNIT OF ACCOUNT.